As the government prepares to sign us up to the Trans Pacific Partnership Agreement, the country has been lulled into a false sense of security that came with our change in government and a rebranding of a not so comprehensive and progressive deal. Our government is set to sign the rebranded Comprehensive and Progressive Agreement on Trans-Pacific Partnership (CPTPP) along with 10 other nations in Chile on the 8th March. The sense of outrage that the majority of our nation expressed during many rallies in the lead up to the previous signing in Auckland on the 4th February 2016 is muted. Why? Firstly, we had an election which led to a change of government being formed by Labour and NZ First with help from The Greens. 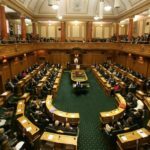 Many people are feeling that the new Prime Minister leading a left-wing government want to act in the best interest of New Zealand and need to be given a chance. Secondly, remember those 5 “non-negotiable” bottom lines that Labour said would have to be met before they agreed to a TPPA deal? Now that Labour have formed a government, they have stated that the resurrected deal meets those 5 bottom lines. NZ First who were such outspoken critics of the deal and who campaigned on not signing NZ up to the TPPA as one of their bottom lines, has done a complete u-turn. Now it is telling the nation that the CPTPP is a deal that it can support because of the trade opportunities that it will bring the country, and cutbacks to the powers it gives to foreign investors. This sounds like the government has worked hard to secure a good deal, right? What makes it comprehensive and progressive? What has changed from the original TPPA? We still do not know exactly what changes have been made to the TPPA-11 because it has been re-negotiated in secret. The text will not be available until after the agreement is signed – so much for transparency! But we do know that the US has left the original deal due to the Trump presidency, after Obama couldn’t get it through the Congress while he was president. And we do know that 22 provisions out of over a thousand provisions have been suspended. This is what they are calling comprehensive and progressive. But these 22 provisions could be re-activated any time in the future that the US decides to rejoin. Why are these provisions only being suspended and not removed? We also know that the institutional provisions are different. We have been told them in a general sense, but not the details, which matter (eg the terms of US re-entry, the periodic reviews of the agreement, which are usually only about making it more liberalised). We also don’t have the side letters. Labour has told us that some countries have agreed to no ISDS side letters, but not all. For the NZ public to learn more about what the CPTPP will mean for our country, we have organised 5 public meetings around the country over the coming two weeks. 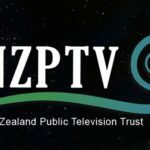 The public can hear from the experts on what changes we know have been made to the TPPA and what the rebranded CPTPP will mean for New Zealand. Hear them talk about how Labour’s 5 bottom lines haven’t been met and why it is not the deal that NZ First would have accepted before the election. The first of the 5 public meetings kicks off tonight in Auckland from 6.30pm at the Ellen Melville Centre, in the Auckland CBD. This will be followed by meetings in Wellington on 14 Feb, Nelson on 20 Feb, Christchurch and 21st Feb and Dunedin on 22nd Feb.
At tonight’s Auckland meeting New Zealand’s leading expert on the TPPA Professor Jane Kelsey will be speaking along with Dr Burcu Kilic from the US organisation Public Citizen and ex-MP Laila Harre. Professor Kelsey will be speaking about what has and hasn’t changed, how this relates to other negotiations, how this relates to the new government’s review and the process in NZ on TPPA in the House and the likely timeline. Dr Kilic will speak to the medical and e-commerce issues, and Laila Harre will speak about the issues confronting the unions, and her assessment of the problems and solutions. 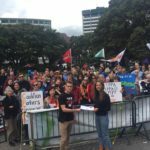 It’s Our Future invites the citizens of New Zealand to attend one of their public meetings to learn what the TPPA will really mean for New Zealand. It is really important that the public are informed about what our government is signing our country up to as this will affect our future generations to come. The Auckland event will be live streamed from here at 6.30pm for all those of you who may not be able to make it along to a meeting. See here for the details of all 5 meetings. To contribute to the cost of holding these meetings and helping us to continue fighting the TPPA, please donate here.